I’ve long known the African elephant is endangered. But until I started writing about wildlife conservation and animal welfare, I wasn’t aware of the complexity of their survival problem.It’s an unfolding tragedy that spans countries and continents, and involves drug, terrorist, and ivory syndicates that exploit elephants for power and profit. Even government representatives, relied upon to protect people and wildlife, can be involved in corruption. Amidst the greed and betrayal, wildlife conservation groups are gaining ground in the fight against poaching and human-elephant conflict. I’ve been following the work of the David Sheldrick Wildlife Trust on their website, Facebook and Twitter platforms and I’ve been inspired by their anti-poaching initiatives, elephant orphan rescues and community education programs. As well as keeping me up to date with news, their social media space has connected me to a community of kind-hearted people who care about animals, not for any material interest, but because they believe animals should live a full life in their natural habitat. The David Sheldrick Wildlife Trust was founded in 1977 by Dame Daphne Sheldrick in honour of her husband, naturalist David Sheldrick. Daphne was the first person to raise an elephant orphan that was still dependent on milk. Alongside her family, she is still very much involved in the charity’s work. The elephant orphan foster program gives a moving insight into the day to day care of elephant orphans. 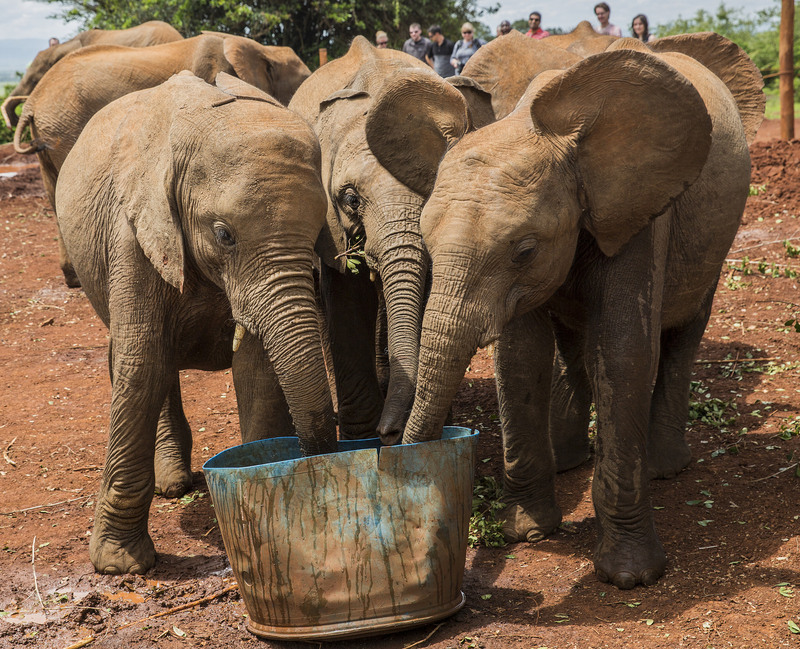 The trust posts news of recently rescued orphans, and keeper’s updates on other calves at the Nairobi nursery, as well as those orphans at the next stage of rehabilitation at IThumba and Voi in Tsavo East National park. A previous post Elephant orphans find comfort in wool blankets describes orphan rescues and life at the Nairobi nursery – some calves are only hours old when found. Each orphan has a story of tragedy and hope. Recently, the Sheldrick trust reported the wonderful news that ex-orphan Wendi gave birth to a calf in the wild then returned to the orphan unit to show her new-born to former keepers. If you are able to help by joining the on-line fostering program, DSWT sends a monthly update on your chosen elephant orphan, as well as a beautiful watercolour in digital form. In her paintings, Angela Sheldrick captures and preserves tender moments of orphan life. If you have a soft spot for rhinos, DSWT also cares for rhino orphans! If you can’t help with financial support, you can still follow the trust on social media and spread the word on their conservation work. 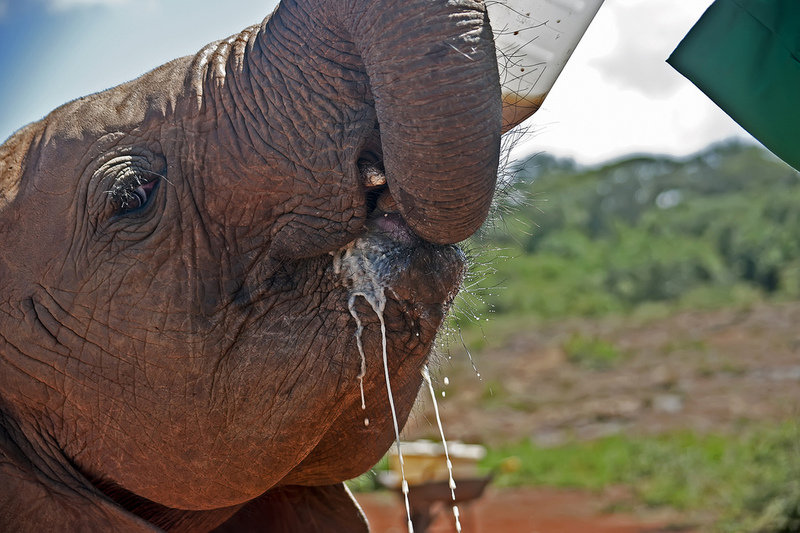 Join the David Sheldrick Wildlife Trust elephant orphan community in whatever way you can. Be part of something special!